With the JReviews Advanced Filtering for Joomla and WordPress you can easily add faceted advanced search to your site so users can quickly find what they are looking for. Advanced Filtering in JReviews looks and works like what you see on popular sites like Amazon.com, eBay.com, and TripAdvisor.com. The Advanced Filtering feature not only looks great, but it's also very fast because it updates results instantly as users select different filter options, without the need to reload the entire page. 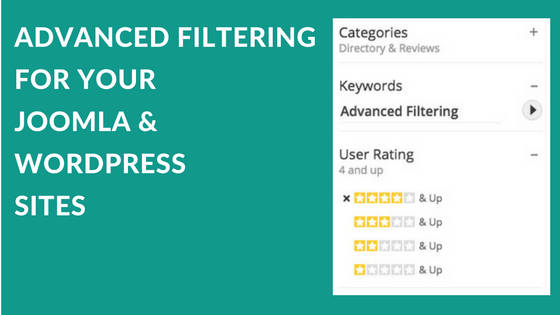 Advanced Filtering is part of the JReviews core and you can easily add it to your site using the included Advanced Filtering Module and Widget for Joomla and WordPress respectively. The settings allow you to easily include or exclude filters for keywords, categories, listing types and ratings and we've implemented a simple to use shortcode system for adding custom field filters. You can view the different filter display types for lists (checkbox, link and linkboxed) below and read the Advanced Filtering Documentation for all the different attributes available for the filter shortcode. You can see the different filter types that are available below. For fields with options (checkbox, radio, select and multiselect) you can choose the select, checkbox, link and linkboxed display options. Other filter types are assigned automatically depending on the field type. Such a powerful feature would not be complete without an equally powerful mobile implementation. When used on a mobile device the filters hide automatically and a new filter button appears at the top of the list. Users can use this button to trigger a side panel with all the filter options. How cool is that!? We look forward to seeing how you use this new feature on your JReviews sites! We've taken the popular advanced filtering functionality for listings and created the new advanced filtering for user reviews. This allows users to find specific reviews for listings within a listing itself, or also sitewide. The review functionality has all the same great features as the listings one. You can create your own form with review custom fields and it also has live updates so the results appear on the page without page re-loads. Thanks Alex. It's great to see new powerful features like the advanced filtering being quickly deployed on client sites to improve the overall user experience. Fantastic features, thanks for sharing the info. Thanks! I am glad you like the new filtering functionality in JReviews.